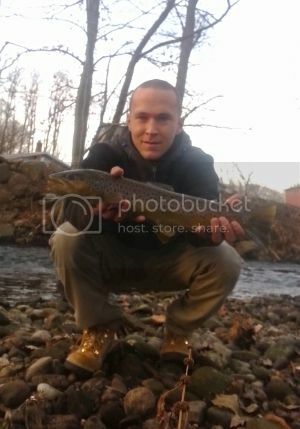 CTFishTalk.com: Big Brown - Connecticut Trout Fishing ( CT Trout Fishing ) - A Community Built for Connecticut Fisherman. The cold weather has had me cooped up in the house the past few days so I figured id share a few pictures from last years trout season. 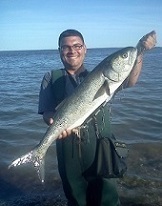 Me and my buddy thought the big one was a seeforellen until DEEP confirmed that it was a wild trout. All caught on artificials and RELEASED. Thanks Michael, that was my first season fishing for trout I never knew what I was missing. I've been fishing for trout since I was 3 and have always loved the action. 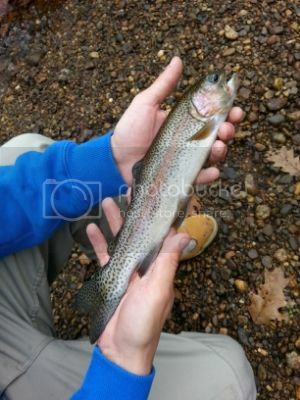 Browns are the ones with the appetite while rainbows are the aggressive and acrobatic ones. Brookies are fast and fun. 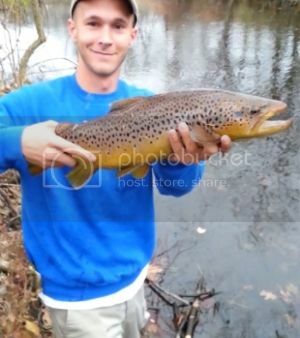 Tiger trout have a combination of a brown trout's appetite and brookie's energy. Im deff trying to get into some Brookies and some nice Rainbows this year, the spring cant come soon enough. By wild you mean born wild?? Trust me. Use waxworms ! Other than using worms, power bait, and mealies this spring, here's a list of certain lures that are trout river killers. Silvers, whites, grays, golds, browns, and oranges have always been my best producers. Purples and reds are good too. Any of those Rapalas in colors imitating and actual shiner or type of trout are perfect. Gold and copper colors on those Rapalas also work well. 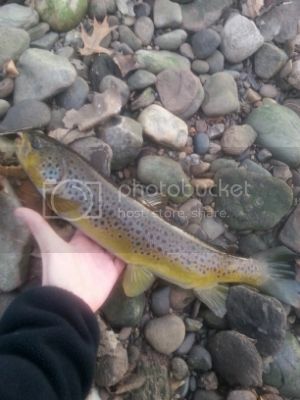 Thanks man, not positive but the guy from dep told me it was a wild brown trout when I asked if it was a seeforellen.